"One of my favorite parts of hibachi is the fried rice and I was determined to make it at home. This recipe is quick and easy and is sure to be a big hit. 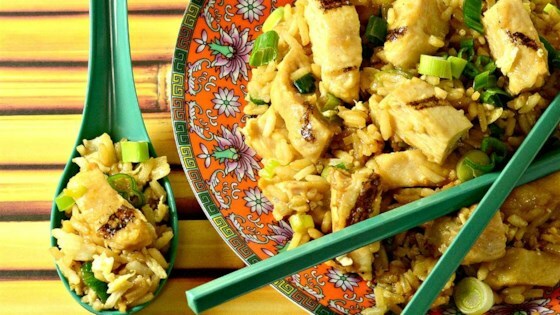 I enjoy using left-over teriyaki chicken in my fried rice, but you can use any meat you want or no meat at all! With or without chicken it is equally as delicious and a great side dish! You can use more or less garlic, depending on your personal preference." Heat a wok or non-stick skillet over medium-high heat; add olive oil. Cook and stir eggs in the hot oil until cooked through, 2 to 3 minutes. Add chicken, green onion, and garlic to scrambled eggs; cook and stir until heated through, about 2 minutes. Mix rice into egg mixture; cook and stir until rice is warmed, about 2 minutes. Add soy sauce; cook and stir until rice mixture is evenly coated, about 3 minutes. One thing I see many of these fried rice recipes missing that I've found really makes a difference is to refrigerate the cooked rice overnight before cooking. Really good! Instead of chicken I used chopped shiitake mushrooms and peas. It was Delish and it the spot for my fried rice craving! Absolutely delicious! I added in a leftover chicken thigh baked previously in a sweet and spicy mustard sauce. My kids are very picky but they really loved this recipe! I've made it three times now and every time they rave. Thank you for posting it! This is good, But it is way better when i use Jasmine Rice!, Thats the kind of rice they use at Japanese places..